"...a star guitarist...expressive, flawless guitar playing..."
"...musically and technically superb at any time ..."
Admir Doçi is one of the most innovative guitarists of his generation. His interpretations are acclaimed for their virtuosity, their big dynamic range, the technical mastery and for their artistic maturity from the press all over the world. 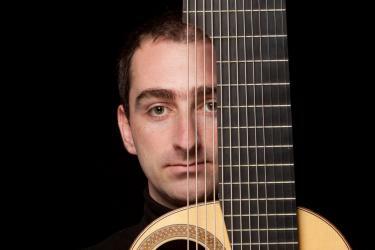 Born in Tirana (Albania) 1982 he studied at the Zurich University of the Arts with Prof. Anders Miolin and won over ten awards at international competitions in Switzerland, Thailand and Liechtenstein (among others the first prize at the international guitar competition of Liechtenstein). He is artist of the Marguerite Meister Foundation, Hans Schaeuble Foundation Zurich, Friedl Wald Foundation Basel and Schweizerischer Tonkünstlerverein Association. Princess Sophie of Liechtenstein awarded him “for his virtuosity and artistry”. His busy concert schedule includes appearances at renowned festivals, such as Boswiler Sommer, Forum Gitarre Vienna, Guitar Symposium Iserlohn, Verona International Guitar Festival, Ohrid Summer Festival, as well as long term collaborations with mezzo soprano Leila Pfister, cellist Mattia Zappa and the Galatea Quartet. As a soloist he has performed with well-known conductors such as Kai Bumann, Markus Bosch or Carlos Dominguez-Nieto with Kammerphilharmonie Graubünden, Ensemble of contemporary music Zürich, Albanian Radio-Symphony Orchestra, Neues Glarner Musikkollegium, Zuger Sinfonietta and Swiss Youth Symphonic Orchestra. He already made his debut at prestigious concert halls such as Tonhalle Zurich and Victoria Hall Geneve. Contemporary music plays a special role in his career, premiering more than 30 works dedicated to him from composers like Martin Derungs, Fabian Müller or Martin Schmid. His CD recordings with label Guild are played worldwide by renowned radios such as BBC Radio, Fine Arts Radio Missouri U.S.A., or RTE Ireland. Since 2003 he is a highly demanded professor for master courses at international guitar festivals worldwide. 2008 - 2018 he was professor at Tirana University of the Arts (Albania), Cantonal Highschool of Kusnacht (Switzerland), Evangelic Highschool of Schiers (Switzerland), Music Faculty at the State University of Tetovo (Macedonia), etc. 2016 & 2017 he was guest lecturer at Zurich University f the Arts, Conservatoire "Les Deux Muses" Paris and at Insitute Superieur des Arts et des Actions Culturelles Abidjan (Ivory Coast). From 2018 he is appointed as a guest professor at Conservatorio Statale di Musica "Giuseppe Verdi" di Torino (Italy). He lives with his family in Italy.